Eat Bake Laugh: Cupcake Pops! I know, I know. It's been awhile. The summer has turned into one giant activity - an endless array of beach days, parties, barbeques and all around fabulousness that I haven't been able to break free from! Fear not, as I have been busy in the kitchen and soon you will be so inundated with recipes that you will be sick and tired of hearing from me - I promise. 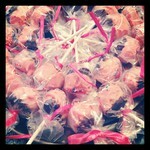 In the meantime, I leave you with cake pops from Bakerella. I made these for my brother in-law's engagement party and let me just say - they were a hit! The cake pops are a little time consuming to make, but the finished product was so adorable (and tasty!) I wouldn't hesitate to make them again. You can find the recipe for the cake pops here. I will be back soon! In the meantime, I hope you are all enjoying the summer!